The apple desserts are starting to pop up everywhere and I’m jumping on the apple wagon too. 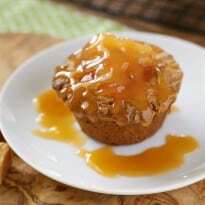 I adore the apple and caramel combination and imagined a cake cup with the perfect marriage of flavours. I had the idea of the caramel melting at the bottom of the cake cup. I had to time it so the cake cup was almost baked and that the caramel had enough time to soften and melt. It gets even better with caramel sauce drizzled on top. It’s sooooo sweet and perfectly decadent. I didn’t know whether or not to lick off all that sweet sticky caramel first or pop the cake up in my mouth and experience all the deliciousness simultaneously. 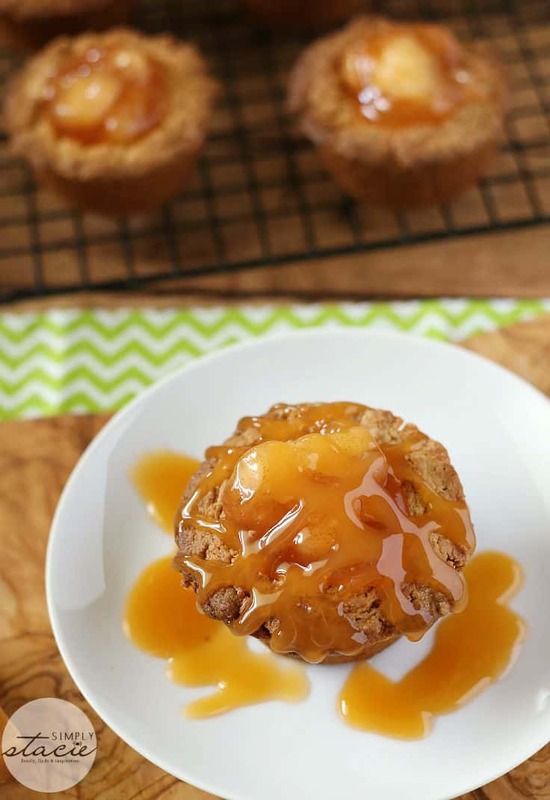 They look a bit like little apple caramel pies don’t they? Serve with some vanilla ice cream if you like! 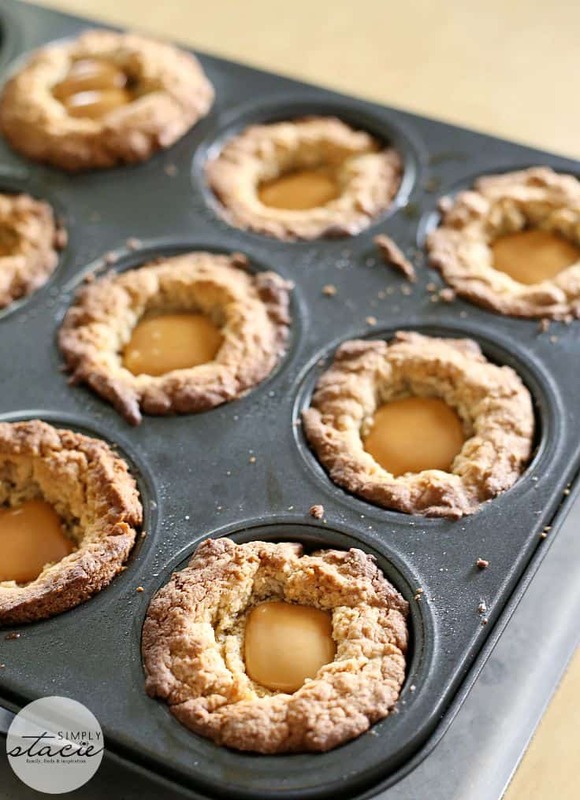 Out of all the cake and cookie cups I’ve made recently, this recipe is one of my faves. What are your thoughts on the caramel apple flavour combo? 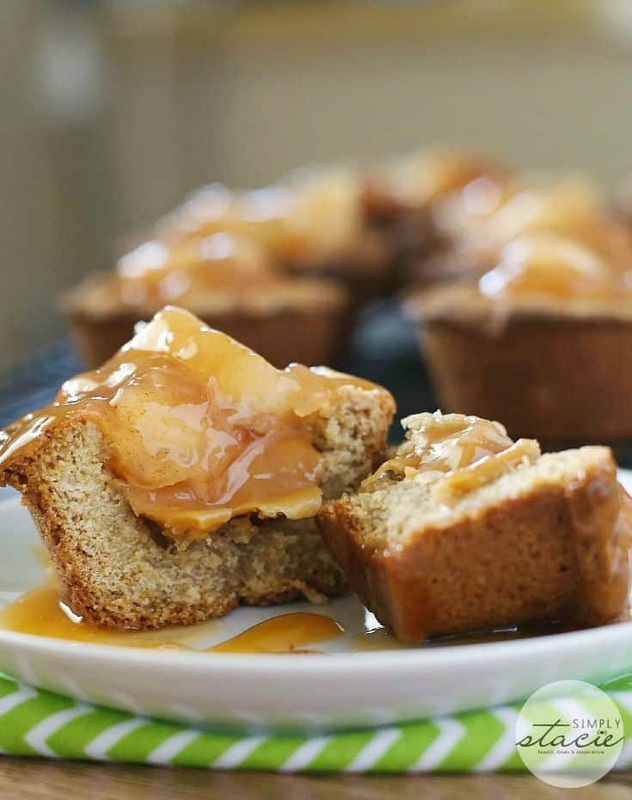 Sweet and decadent recipe for Caramel Apple Cake Cups made from butter pecan cake mix, Kraft caramels and apple pie filling! In a mixing bowl, stir together cake mix, butter and eggs. Take about a 1 tbsp of dough and press it into the muffin tin. Make sure to not make it too thick or it won’t cook entirely in the center. Place in oven for about 7 minutes. Remove from oven and poke the center with a spoon to create your cup. Put the cake cups back in the oven for another 5 minutes and then repeat the process to create your cup. Place back in the oven for another 5 minutes. They should be almost ready by now. Remove from the oven and use the spoon again to poke the center to make it cup-shaped. Then place one caramel in each cup. Put back in the oven for another 5 to 9 minutes, until caramel is melted and cake cups are golden. 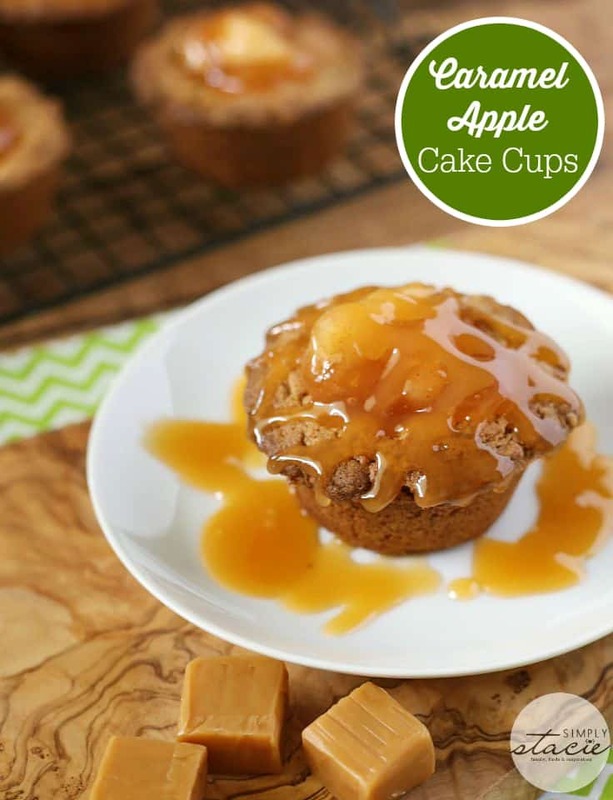 Once cool, add about 1 tsp of apple pie filling to each cake cup. Drizzle with caramel sauce if desired. Wow these look and sound so yummy!!! A must try this fall! These sound absolutely delicious! I love caramel and apples. Oh no I have to make these today!! I am totally drooling, they look so easy and good, I will use a mixture I make from the apples on our tree, I can’t wait for dessert tonight! 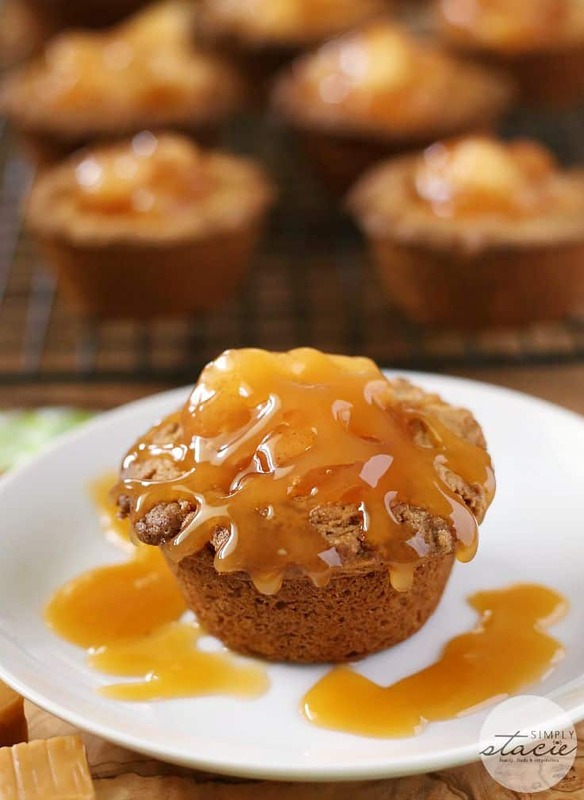 Caramel and apples are an awesome combination.These look so fabulously delicious.Thank you for the recipe that I will make often. I’m so glad you jumped on the apple recipe idea for Fall! These look and sound delicious. I like that you used the butter pecan cake mix too. So tasty!! Yum! I think the apple caramel flavour combo is a big hit. I can’t wait to give this a try. Thank you for sharing this recipe. Oh me Oh my! These cupcakes sound sooo decadent. A must try recipe! the almost same thing as dipping apple slices into Caramel sauce. yummy. Oh wow, how good do these sound?!! Visiting from Foodie Friday – have a great weekend. These look wonderful! We are pinning them to our Autumn pinterest Board! Looks amazing. Great recipe, great photos. This would go perfect with a mug of hot apple cider.